Abundance - Life is so Amazing! Not everyone will agree, abundance can mean different things to different people! 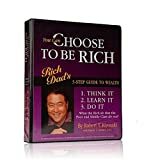 In the end, your life will be a lot easier and you can make more choices and you can give more to charitable causes when you learn to become wealthy! We aren't taught this in school, often times were taught to fear money and that's not right. Imagine all the good you could do with excess income! It starts with learning and re-teaching your mind. There are thousands of successful people who have gone before us and they left the secrets in their books! What the wealthy teach their kids! It comes down to YOUR choice! It doesn't matter your age or background, you can make a choice to start today!